We established in 1993, "S. G. Mechanical Works", always tried our best to make excellent quality Animal Feed Machinery to our customer's satisfaction. We have our own experiment company, where professionals work for the innovations to provide new and better products than before. Furthermore, we believe in maintaining long term healthy relationships with our esteemed customers by offering them unique quality products. We are exporting our quality products in all over the World. 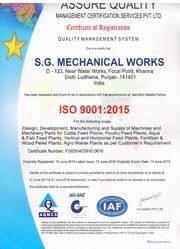 Keeping superior quality and customer satisfaction as the topmost priority, Today S. G. Mechanical Works is major player in the fields of Animal Feed Industry, Poultry-Chicken Feed Industry, Fish, Prawn, Aqua Feed Industry, Pet, Camel, Duck, Horse, Rabbit Feed Industry, Wood Pellets Industry, Biofuel Making Industry, Briquette Industry, Rice Mill Industry etc. Under the guidance of "Mr. Vishal Kumar", Our machines are demanded at large scale in the domestic and international market. clients are love our projects, machines, and spares as they are. In addition, our machinery has created a sensation in the agro sector, the industrial sector with the unmatchable high durability. Manufacturing of Animal Feed Machinery. We are one of the reputed names in manufacturing and supplying of equipment and plants for the Animal Feed Machinery, Chicken Feed Industry, Poultry Feed Industry, Fish Feed Industry, Prawn feed industry, Aqua Feed Industry, Emu Feed Industry Cattle Feed Industry, Mesh Feed Industry, Fertilizer Industry ETC. Our experience in the domain has been acknowledged by our clients. And that’s why they trust in us to deliver excellence with every consignment.